* D’Angelo Ortiz showing off his version of various batting stances. This was adorable. D’Angelo is still at the age where he hasn’t started to get annoying and he holds himself in such a way that you just know he is destined for great things. And right now, he’s still a million kinds of cute. The segment didn’t go on too long and they didn’t beat us to death with “See how cute David Ortiz’ son is”…it was a fun, family-friendly moment and the ASG could use more of them. * Heath Bell talking with the fans (one being a Red Sox fan) in the stands and then giving them gifts (I’m surprised that “Yoda Backpack” wasn’t a trending topic on Twitter last night). Between that and his slide into the pitcher’s mound, Bell showed us how a player can be quirky and fun without being overbearing and annoying (See Wilson, Brian). * Being a total homer, seeing Jacoby Ellsbury, Kevin Youkilis, David Ortiz and, especially, Adrian Gonzalez play was fun even if Youk and Adrian were the only ones to get hits. Watching Adrian Gonzalez hitting a home run the night after he lit up the home run derby was fun (off of Cliff Lee, thank you very much). Heck, I even enjoyed the Red Sox players being introduced pre-game. I’ll admit it, I get a charge out of seeing our guys there even if I pretend I don’t. * I liked the “Stand Up to Cancer” moment and honoring the victims of the Arizona shootings before the game even if I do think that maybe the All Star Game could be a place where we don’t focus on the sad realities of life. Even so, both were beautifully done and made me hate the ASG a little bit less. That was pretty much it. I never really care about who wins, regardless of it counting for home field advantage, but there wasn’t much excitement in last night’s game. I could complain about Brian Wilson’s truly tired act, or Tim McCarver acting like he had never heard the words “Greek God of Walks” before last night (or, really, anything involving Joe Buck and Tim McCarver). I could scoff at how when Joe Buck was taking about the shootings in Arizona the camera went right to Josh Hamilton as if now he is the MLB poster boy for tragedies and I could complain for the millionth time about how ridiculous it is to continue to sing “God Bless America” at a baseball game “to honor America” when we sing the National Anthem before the game starts to do that very thing. But everyone will be complaining this morning (save for National League fans, I suspect) and why send out all those negative vibes, right? We’re stuck with two more days of no Red Sox baseball but if you’re so inclined the Triple A All Star Game is being shown on the MLB Network tonight at 9 ET (pitcher Matt Fox is the lone representative from the PawSox this year). Ten years ago, on the night of the Home Run Derby, my niece Madison was born. At the HRD, Luis Gonzalez ended up being the winner and every year on the night of the Derby, I tell Madison about how Gonzalez won on the day she was born and then went on to beat the Yankees in the World Series. Last night, when I began talking about Luis Gonzalez again, she pointed out that we had our own Gonzalez in the Derby this year and wondered if, since it was her 10th birthday over the weekend, if he would win. We rooted for our Big Papi and for Adrian Gonzalez but oddly enough seeing Robinson Cano win didn’t upset either one of us. It feels like half of MLB is at this year’s All Star Game, doesn’t it? Felix Hernandez was chosen, but because of the rule stating any starters who pitch on the Sunday before the ASG can’t be IN the ASG, he was replaced by Jon Lester. Jon Lester who is on the disabled list and can’t pitch (and they knew this when they chose him as Hernandez’ replacement). Lester has been replaced by Toronto Blue Jay Ricky Romero who, you know, can actually pitch. Hernandez, Lester and Romero are all at the All Star Game this week. Added to that (again thanks to Brown and the link here) we have one out of every nine players in MLB being called an All Star even if they aren’t playing…and collecting their bonus money for making the All Star Team. Derek Jeter, who bowed out of the game after being chosen by fans who really shouldn’t have chosen him, will make an additional $500,000 this year for being on the team, even though he isn’t. I mean, it’s like Selig is now going out of his way to do things to make the fans hate MLB. That isn’t to say I don’t think CC Sabathia didn’t deserve to be chosen for the team. You could argue he did. But he wasn’t. I’m going to guess the rule is however they were voted in (and didn’t make it) is how they go down the line of who replaces ineligible players or players who bail on the game. Shouldn’t there be a rule in place that says you skip over the players who aren’t eligible if they are next in line? This isn’t pre-school…everyone doesn’t go home with a trophy...everyone should not be chosen for the All Star Game. I can’t remember the last time I actually looked forward to an All Star Game (1999, I suppose. MAYBE 2005 and 2008 because Tito was the manager?) and there has been nothing to make me really look forward to this one. That isn’t to say I’m not happy for our guys on the team, especially Jacoby Ellsbury, but I just want real baseball back and the All Star Break is usually one long bore. At least I can thank the Home Run Derby for being entertaining this year. I was trying not to be greedy. I wasn’t really even considering a four-game sweep of the Baltimore Orioles when I wrote that I’d like the Red Sox to go into the All Star break in first place. I won’t lie, though, sweeping the Orioles in four after the Kevin Gregg show the other night, feels pretty damn sweet. I received many “that will only bring this team closer together and now they’ll beat you” messages after the basebrawl. Last night most of the messages were of the “all your team is on steroids” variety. Interesting reading anyway. John Lackey stepped up big and while I had high hopes for Kyle Weiland, his ejection yesterday possibly helped the Red Sox. Hitting Vlad Guererro didn’t seem intentional to anyone but Orioles fans and the home plate umpire, but since the teams had been warned Kyle got the heave-ho, paving the way for Alfredo Aceves to come in and pitch three hitless/scoreless innings. (Serious question: Where would this team be without Aceves? If they still gave away the 10th player award, as of right now he’d be the guy I gave it to.) After Weiland giving up eight hits in four innings, the Red Sox bullpen (Aceves, Daniel Bard and Jonathan Papelbon) combined for five innings, no hits, one walk and seven strike outs. As bad as the Orioles have been playing, I really looked at the second two of the four games as being their good chances to get wins…and I’m very happy at how wrong I was. I only have two things to say about Derek Jeter’s 3000th hit. I’m always one who says if I caught a ball that was someone’s first home run or some kind of milestone, I’d most likely give it back without expecting anything. But when that player is Derek Jeter and it is something as big as his 3000th hit, I would expect a whole lot more than the Yankees shelled out to the guy who caught the home run ball. While people are lauding the guy for being unselfish (and, initially I was too), I can’t put out of my mind that Jeter will make millions off of this accomplishment and all this guy really got were tickets for half a season of baseball. Blows my mind. It’s a visual I could live without, but it made me laugh out loud. 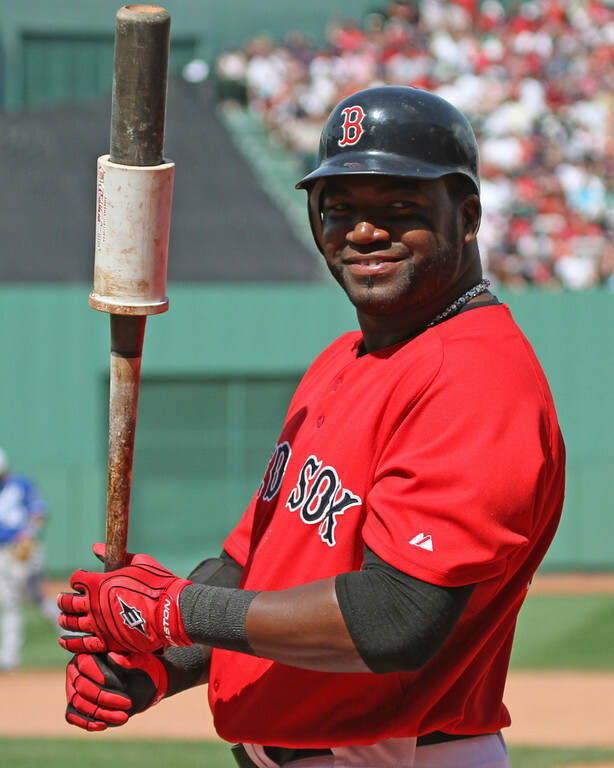 Red Sox don’t play until Friday but we get the Big Papi show at the Home Run Derby tonight and by way of players backing out, getting injured or being ineligible to play (sorry Felix Hernandez), we’re sending six guys to the All Star Game (even though Lester won’t be playing). If you need your Red Sox fix before Friday, you still have these next two days. This is the face America saw all night last night! Courtesy of Kelly O'Connor/sittingstill.net and used with permission. Whatever the reasons, many people don’t like the Home Run Derby. I’m not one of them. While it isn’t my favorite attraction that MLB gives us, there is something entertaining not only in watching the home runs but in watching the players interact and react to the home runs. Last night, David Ortiz once again showed why he has such a place of honor in Major League Baseball. Not because he won the contest but because of how he acted during it all. Knowing that a good final outing by Hanley Ramirez would mean he lost the Derby, Papi was still out there encouraging him and cheering him on (telling Erin Andrews later that Hanley is like a son to him!). It was quite the sight and something that seemed to take the ESPN guys (Yes, America, Bobby Valentine really did call him “Jose Ortiz” and then try to laugh it off by saying “I hope his middle name is Jose”) by surprise. Tonight is the All Star Game and while I genuinely don’t care who wins, I just want the Sox to represent well, I hope folks watch and are entertained. I won’t be able to watch tonight due to a family issue but I know folks will keep me posted in case Adrian Beltre takes out Joe Girardi. My Youk collection from last year. Voting ends at 4pm ET today! All I will say about the sweep is when you have the injuries this team does these things will happen. It was ridiculous how many tweets/posts/status updates I read from people who seemed genuinely mad about it. If you can’t understand the fact that this team is struggling because many of their starters aren’t starting, well then I think you’re a lost cause. Watch the games and hope for the best and take comfort in the knowledge that there is an entire second half to go (and stop blaming the replacements for not being as good as the starters – there is a reason players start and others are in Triple A…being forced into situations you aren’t ready for is no way to be greeted into the organization so folks need to back off a bit). Okay, I guess I had more to say than I thought. If Kevin Youkilis gets voted in, we get shots of him, his lovely wife and adorable son in Los Angeles. If Nick Swisher gets voted in we probably get more videos of him in Tommy Bahama shirts. I’m willing to bet he bleaches his tips for the occasion. We can’t let that happen people. We’re live chatting the All Star Game…do we really want to have to look at Swisher all night? I know folks are down because of the last four games. No one enjoys a losing streak. But voting for Youk is our chance to get some joy out of this week! We can head into the weekend in Toronto proud of our efforts and hoping the team rides Youk’s victory to three of their own! So take that early break today, sit yourself down and VOTE for Kevin Youkilis. You’ll sleep much better if you do. Keep Voting (and join us for live chatting tonight)! Thankfully, my obsessive voting for Kevin Youkilis kept my attention from fully being on the game last night. I did get to see Eric Patterson’s two home runs, though, which was pretty damn exciting. I could care less if Nick Swisher gets in but voting for Youkilis just so he’ll beat Swish is ridiculous. Real fans would’ve voted in Youkilis to begin with not wait for the final vote and use it to spite the Yankees. “Could care less” absolutely drives me batshit. If you could care less that means you COULD care less. It’s couldn’t, darling, couldn’t care less (and, yes, responded to him with that and warned I’d be using his message today). Getting behind the idea of Youk getting good use out of some rest isn’t difficult. Hell, it’s why I didn’t vote in the first place. BUT the idea that Nick Swisher and his .375 OBP, his .509 slugging percentage and his .883 OPS is winning this thing over Youk and his .299 average, 416 OBP, .586 slugging and 1.002 OPS is ridiculous. Swisher is currently batting .296, has two more hits than Youk and 15 more strikeouts than him. Aside from the hits and Ks, Youk’s numbers are higher in every other category. He is, as they say, freaking better than Swisher and Swisher has the added taint of being a Yankee on him so, again, this is a no-brainer peeps. Swish is beautiful and Youk is a dog! Who wants to see his ugly face on national tv? That argument makes me want to punch someone and is another reason we need to keep voting for Youk – his getting in will annoy the crap out of that obnoxious woman. Tonight we’ll be settling back into our Live Chat mode! Felix Doubront will be on the mound to help salvage the possibility of at least a series win against the Tampa Bay Rays! Join us at 7pm ET, won’t you?